arming is hard work. The hours are long, the work is physical, and the risk is great. Farming is full of the unexpected and things beyond one’s control. It’s no wonder that only 1.8 per cent of our population chooses to take up farming. Yet 100 per cent of us eat. Thankfully, farming is also full of wonderful things—especially for those who love the outdoors, working with their hands, creating, and working hard. Another thing to be thankful for is that there is a modest number of courageous young people who are either ‘farm curious’ or have taken the plunge and invested their young years in the hopes of a future in farming. Moss Dance is one of these unique individuals. Dance is only 36 and is the sole owner of Ripple Farm, a transitional to organic farm located in Merville. “I have very mixed feelings about being a landowner,” says Dance, talking as she carefully weeds her carrot patch. “On one hand, I see that systems of land ownership are corrupt and based on the theft of indigenous lands. On the other hand, I have the privilege and family support to own this land, and it offers me a lot of security, as a farmer, to be a landowner. And while I’m hanging on by the skin of my teeth to this land, most of the time, it still feels like an awesome opportunity to be able to plant an apple tree and know I’ll be here when the first fruits appear. Dance admits that farming is hard, but she also believes that we need to do what we can to attract more young people to the craft of farming as a profession. “It’s no secret that farming is a tough profession. The challenge for the Comox Valley, and most other communities across Canada, is to attract and retain younger farmers. Most of the fresh produce consumed by our community comes from California, where droughts are devastating farms. When scarcity drives up food prices in the grocery store there will be a higher demand for year-round, locally produced food.” According to Dance, if we don’t get young people to take up farming, we may have serious issues with food security in the future. We need to encourage a new generation of farmers because most of our existing farmers are getting ready to retire. For example, Statistics Canada states that the average age of the 650 farmers in the Comox Valley in 2014 is estimated to be 59. Also according to Statistics Canada, as of 2011, only 25 farmers in the Comox Valley were 35 or younger. And that’s the crux of the problem. The number of family farms is shrinking. There just aren’t many young people who have grown up on a farm, and many of those who have grown up on farms don’t want to continue the legacy. But we still need people to farm our fields and to grow our food. Speaking of soil, we have a lot of beautiful land in the Comox Valley that is just waiting to be farmed. According to Statistics Canada, though the total area of farmed land in our Valley is just over 14,000 hectares, much of the arable land in the Valley isn’t being used to grow food for human consumption. In 2013 Dance became the Vancouver Island coordinator for an organization called Young Agrarians that, among other things, works to link up young and new farmers with experienced farmers, so information and wisdom can be shared. Toward this goal, the organization sets up land-linking events, where landowners and potential farmers can meet and discuss land lease possibilities. Besides meeting established farmers, Young Agrarians believes that it’s just as important for the young farmers to meet one another. “The value of bringing farmers together is huge. So we organize on the ground events so farmers can get to know each other. Our last event was a farmer mixer where we brought young and new farmers together for a day of workshops and networking. It’s a place where they can geek out about farming,” Dance says, laughing. “You know… they can talk about that new chicken tractor or their recent soil test! Dance is also working to bring farmers and community members together through the Merville Organics CSA (Community Supported Agriculture) box program, a local and farm-based distribution system for organic produce. It’s a collaboration of five farms, all run by young farmers, three of whom were mentored through the Young Agrarians program. The co-op consists of Dance at Ripple Farm, Arzeena Hamir at Amara Farm, Robin Sturley at Green Arrow Farm, Calliope Gazetas and Russell Heitzmann at Umbella Farm, and Kira and Ingemar Kotilla at Kloverdalen Farm. Collaboration is good for the community too, as we all benefit when we become closer to the food we eat. “It’s about increasing community access to high-quality, locally grown produce. It’s also about farmer-eater relationships. CSA members pledge to support local farms, with growers and consumers sharing the risks and benefits of food production. When farmers and consumers collaborate through a CSA box program it’s a mutually beneficial relationship,” explains Dance. CSA members purchase shares in the spring for a share of the anticipated harvest. Once harvesting begins, from July to September, members receive weekly shares of fresh, in-season produce from the farms. Payment is given in advance in late winter/early spring to provide necessary start-up funds for the farms. Boxes are delivered once a week to either a central location in the Comox Valley, or to one of the farms, where members can pick them up. For those who were not able to become part of the Merville Organics CSA box program this year, you can find their organic vegetables at the Comox Valley Farmer’s Market year round. A waiting list for the CSA box program is also available on their website. For Dance, the future of farming is dependent on organizations such as Young Agrarians and collaborative ventures such as the CSA box program. “The future of food production in the Comox Valley depends on taking pro-active measures to attract, retain and support new growers and producers,” she says. For more about the Young Agrarians and upcoming events across BC visit www.youngagrarians.org, or find them on Facebook. It’s late afternoon on a spring day and the skatepark near Isfeld Secondary School is well and truly alive. Throngs of adolescents hum along the urban, cement landscape on skateboards weaving, rising, turning, falling, and smiling. Younger kids play on a relatively new addition to skatepark vernacular—scooters—watching the bigger kids do their thing and urging themselves forward in simple imitation. Several older males, tanned and taught, carve impressive lines through the dips and grooves of the cement bowls, not so much hyped by the high-wire, risky tricks of youth but more nestled in stylistic arches and long sways and the joys of momentum board riding. As the sun beats down, shirts come off and sweat begins to drip down backs and foreheads. It’s clearly a good workout. There is chatter, friendly banter amongst sections of the park occupants urging each other into finally nailing a particular trick or seeking new thrills and pushing boundaries on the lips, curves and precipices of the park. Others ride with earphones seemingly in a state of Zen, eyes wide and focused on the all-consuming art of riding. Occasionally there are falls, errant boards shooting across the landscape, growls of disappointment or momentary pain forthcoming. And rather muted signs of mini victories when new tricks are landed; it seems that over-dramatic high-fives and hugs as often seen in more commercial sporting endeavors holds little favor here. There is a sense of humility and personal drive snuffed of egotistical swagger and bravado. The playing field seems oddly, remarkably even out here. It’s pure freedom of expression, a huge, expansive concrete canvas on which to leave invisible wheel marks of joy, untempered creation and stylistic charm. And there’s a brotherhood that extends beyond age, gender, skin color, stature, social class. In this, there is much beauty to behold. Watch the theatrics closely enough and you’ll witness something admirable about the place. In amongst the shards and echoes of luminous graffiti many associate with such venues (of which the skaters themselves despise, as it makes for a more slippery and treacherous surface on which to roll) there is a sense of respect for the other. A nod of the head to act as a pseudo-hello. A wave. A quiet, off-handed compliment. One kid falls and the others, sometimes openly and sometimes discreetly, check on his/her wellbeing. Sharing space, riders watch and wait their turn to drop into bowls or jump up onto edges and flip down over staircases. One expects to see a pecking order of sorts, youngsters doing a kind of apprenticeship, but it’s not that way. Ownership of this urban playground is intrinsic in the actions of riders—it is theirs to ride, keep clean and look after, but nonetheless it is shared, public space and all walks of life are welcomed into the boarding fraternity under the one solid condition of mutual respect. Skateboarding as we know it was probably born sometime in the late 1940s or early 1950s, when surfers in California wanted something to do when the waves were flat. No one really knows who made the first board; several people came up with similar ideas at around the same time. The first manufactured skateboards were ordered by a Los Angeles surf shop, meant to be used by surfers in their downtime. Accordingly, skateboarding was originally denoted “sidewalk surfing” and early skaters emulated surfing style and maneuvers, mostly performing barefoot. In addition to being considered a recreational activity, an art form, and a method of transportation, today the global skateboarding market is worth an estimated $5 billion in annual revenue with approximately 12 million active skateboarders in the world. At the epicentre of the local skateboarding scene is Courtenay-based skateboarding shop, One Thirty Three. For 14 years, Trevor Weir has worked in and managed the store. He recalls the drawn-out process of initially bringing skate facilities to the Comox Valley. “Back in 2004, a group of local skaters attended town meetings to discuss the idea of a skate park in the area. It was a long process and we were basically begging the city to support the concept. We each drew pictures of a skatepark we’d like to see, then once the city was on board they came up with some designs and then the people voted.” With backing from the city, a Vancouver-based operation began the task of preparing the chosen location for an influx of cement poured over the skeleton of the park’s soon-to-be landscape. Of the local skateboarding scene, Weir adds, “It’s a really positive scene. There are lots of good riders of all ages and people are positive and friendly.” One Thirty Three sponsors about 15 local riders, shoots videos of boarding action and posts them on social media, and helps contribute toward the costs of skating trips and riding contests. He talks of several local places, or ‘spots’, where skateboarders gather to freeride, including the Vanier 12 set—a staircase out front of Vanier school—and the Comox Elementary 10 stair. He mentions a few standout riders, including Sascha Daley, who has adorned the cover of numerous skate magazines, Shay Sandiford, who has won competitions up and down Vancouver Island, and Jason Wilson, another local shredder. The sport of skateboarding has traversed a ubiquitous rite of passage since the sports pioneering days. It has been, at certain times, marred by a stereotype that it was rebellious and anti-establishment. Despite this, the image of the skateboarder as a non-conforming youth has faded in recent years. Certain cities still oppose the building of skateparks in their neighborhoods for fear of increased crime and drugs in the area. The rift between the old image of skateboarding and a newer one is quite visible: some magazines still opt to portray skateboarding as dirty, rebellious, and still firmly tied to the punk rock music genre, while other publications intentionally paint a more diverse and controlled picture of skateboarding. Furthermore, as more professional skaters use hip-hop, reggae or hard-rock music accompaniment in their videos, many urban youths, hip-hop fans, reggae fans, and hard rock fans are also drawn to skateboarding, further diluting the sport’s punk image. As with the progression of all sports, change is inevitable. 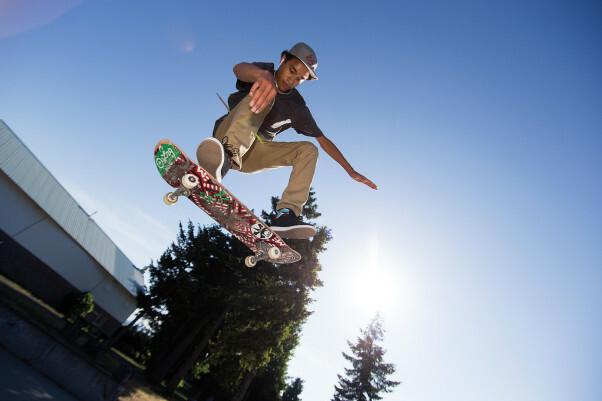 One positive focal shift is that skateboarding and skateparks have quite recently begun to be viewed and used in a variety of new ways to complement academic lessons in schools, including new non-traditional physical education skateboarding programs that are used to encourage youth to have better attendance, self-discipline and confidence. This is also based on the healthy physical opportunities skateboarding is understood to bring participants for muscle and bone strengthening, balance and the positive impacts it can have on youth in teaching them mutual respect, social networking, artistic expression and an appreciation of the environment. OneAreaCode is a volunteer staffed not-for-profit society with a board of directors consisting of skateboard retailers, skateboard brand and distribution owners, professional skateboarders, and senior level educators with legal and financial specialties. Local skater and founder of the organization, Brett Box, explains that in 2012 OneAreaCode started hosting a “Shoes and Equipment” program that assists full-time student skateboarders with their necessary hard-goods at wholesale cost, and later the right to full sponsorships. In exchange for this, participants must embark on positive social, educational, and home contributions. In 2014 the Foundation donated more than $20,000 in shoes, clothing and school supplies to BC children living in homes below the low-income cut-off. “Through our program so far we have reduced online/skatepark/school bullying, substance abuse/promotion, reduced truancy and classroom distractions and given our participants a tool against peer pressure to drink or use drugs,” Box says. It’s a real-life example of confronting modern-day youth issues head on with renewed zest, from a slightly more relevant, and perhaps poignant, angle. At the Comox skatepark, three young OneAreaCode riders—teenagers Julian Nelson, Cole Torry, and Reed Stevenson—happily hop off their skateboards to lend a teenage perspective to the dialogue. The teens talk for half an hour or more about the merits of skateboarding, the local scene, and future ambitions. The conversation flows easily. All three are healthy, articulate, and confident teens, bold in their alertness and observations—the sort of kids society is surely proud of. Globally, over the last few years many cities have begun to implement recreation plans and statutes as part of their vision for local parks and communities to make public lands more available for skateboarding, inviting skateboarders to come in off of the city streets and into organized skateboarding activity areas. Today there are more than 4,000 skateparks worldwide, as skaters have morphed into designers, adding features for all levels of riders. As a representation of the future of the sport, one of the largest locations ever built to skateboard in the world, the SMP Skatepark in China, is 36,000 square feet in size and was built complete with a 5,000-seat stadium. From the grand scope and densely populous arenas of China to the small town heartbeat of Comox is a neat juxtaposition. At the Isfeld Skatepark the sunny spring day is winding down, culminating in a dizzying splendor of reds and mauves in the fading skyline. One by one and group by group youngsters file out of the park—their concrete playground and second home—dumping garbage into the trash cans as they leave. What remains is a clean, sweat-scented coliseum of personal expression and growth, an oft misunderstood and falsely-labeled locale. Undoubtedly though, an invaluable coming-of-age platform from which to learn life lessons and leap into the joys and mysteries of the big world.